There are a lot of guides out there about contouring. Some are helpful, some less so. This one, like pretty much all my guides, aims to describe contouring in the easiest and simplest way. This time, with drawings, yay! Contour = putting light and dark in various places to draw attention to parts of your face/eye/whatever. The light is usually a higher and the dark a bronzer. Sometimes the darker one will be called a ‘contour’ and the lighter a ‘highlight’, but I just use the word contour for both. When you contour your face, the usual thing you want to focus on is cheekbones: apply highlight just on or above your cheekbones, and ideally the bronzer just below. You can find where to apply bronzer by sucking in your cheeks to make a fish face! 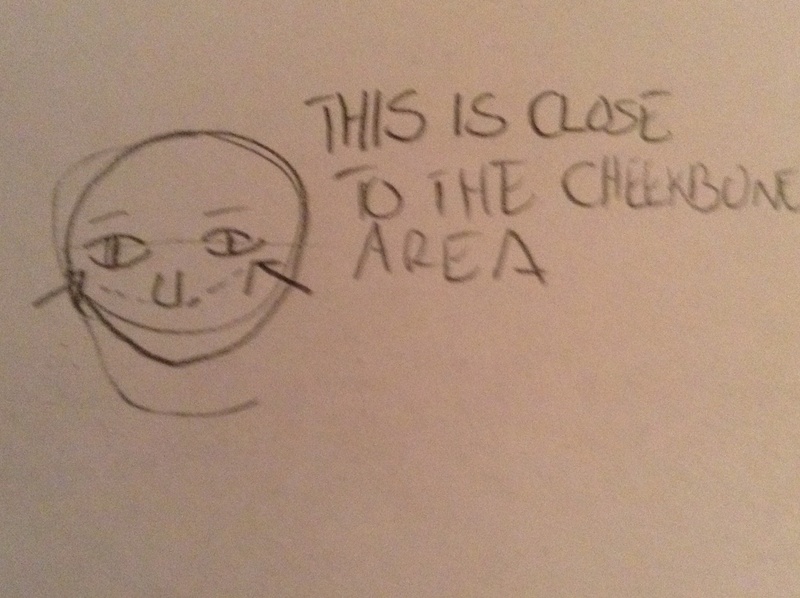 Finding your cheekbones is a bit harder, because you actually have to feel for them. They’re usually in a diagonal-ish line going out from the bottom of your nose (they stick out a bit so you may want to use your fingers to find them, like I said earlier). 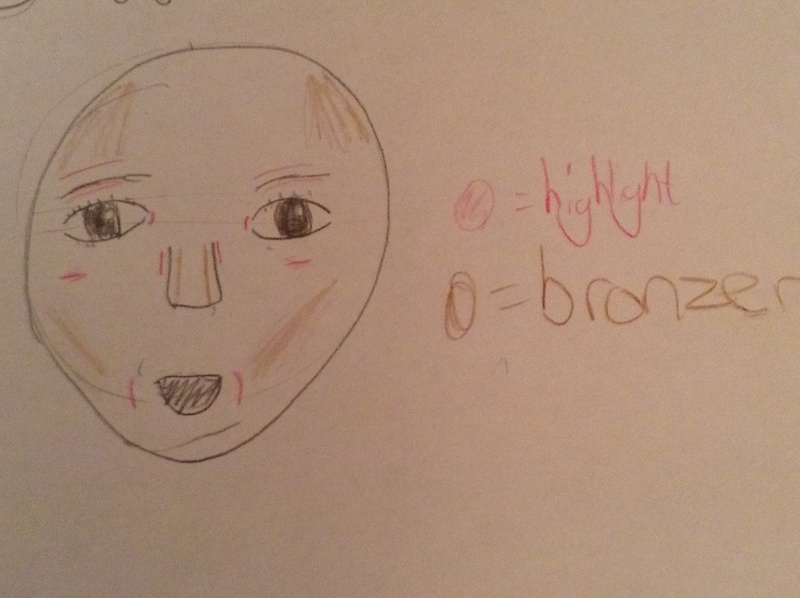 You can also bronze around the sides of your forehead and nose as illustrated in the picture. (I’ve always wanted to say that). And highlighting? After you highlight your cheekbones, highlight on your ‘expression lines’ so: around your mouth and nose. Then, highlight under and over your eyebrows to make them stand out a bit more (if you want) and in the corners of your eyes, which will make you look more ‘awake’. This can be a good light alternative to under eye concealer, especially if you’re just us using a light concealer as your highlighter. This isn’t really eye contouring, but a nice neutral eyeshadow is to do a wash of a shade similar or slightly lighter than your skin tone, then put a lighter one in the inner corner and a darker one on the outer edge. Do you need to do it all? It’s up to you. Personally, I don’t do the whole lot every time because it’s a bit of a drag, but I…how do I put this? I’m not morning girl. I like to sleep. Thus, I end up with not much time. The same may not be true for you! Valentine’s day is coming up, so although I won’t be participating in the whole give-a-card-then-let-someone-accidentally-find-out-and-tell-the-recipient tradition that is currently in operation at our school (or will I?) I am feeling the vibes. Happiness! Cute things! Hearts! Chocolate! What about you guys? What are your experiences and plans for this year’s Valentine’s? On a side note, I don’t think I’ve ever explained my use of the term ‘guys’. I usually use it to mean the people around me, not just boys. In this case, that’s you, the readers.